Copper granulator machine technological process _ PCB recycling machine,cable wire recycling machine,E-waste recycling plant,precious metal refining machine system,E-waste shredder,plastic and metal recycling production line,copper electrolysis system-Zhengzhou Zhengyang Machinery Equipment Co.,Ltd. With the rapid development of modern production technology, more and more high-tech products put into use. Copper granulator machine is mainly applied to recycle the waste wire and cable, can separate copper and plastic, and high separation rate, no pollution. 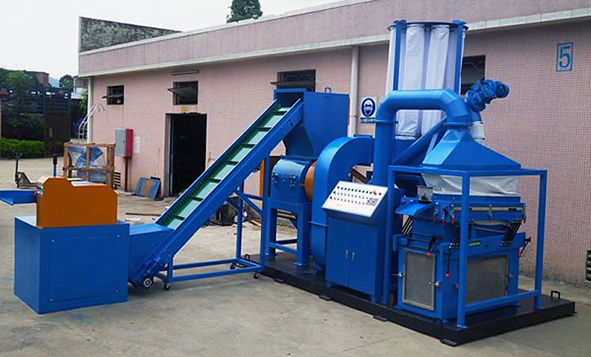 Copper granulator machine is used for scrap copper pieces will be the separation of copper and plastic machinery. Due to the bronze statue of a rice after separation. So called Copper granulator machine. Copper granulator machine mainly USES the air separator or electrostatic separator is more environmentally friendly methods for sorting. The main technological process is: crush – air classifiers – (electrostatic separation) – dust.